How can you have a compelling performance, and achieve your goals without appearing fake or manipulative? Tips on how to perform authentically. Freshbooks is offering you a month of unrestricted use of their online accounting software totally free right now. Claim your free month at www.Freshbooks.com/stealtheshow and enter “Steal the Show” in the “How did you hear about us” section. 00:00: Welcome to Steal the Show with Michael Port. I’m Michael. Let’s deal with authenticity today. It’s one of the big questions that I get. “How do you behave authentically when you’re performing? 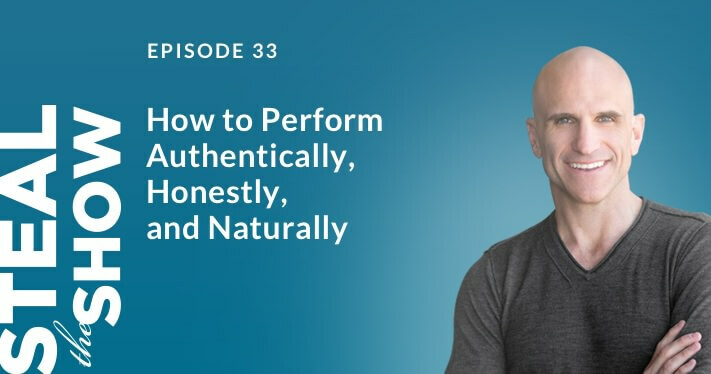 Because isn’t performance fake?” is one of the questions that people ask me, it’s one of the concerns that people have, and rightfully so, that if they are performing then they’re somehow phony or fake. I get that completely because you have certainly seen people that you consider fake or phony, people that you feel either aren’t honest, or they’re a little manipulative, or they just seem sort of full of it. And sometimes people are really quite good people but they come across as a little bit phony because they’re pushing or they’re trying to puff themselves up, you know, make themselves seem important. So their intentions aren’t bad but they may be a little insecure and so they wanna puff themselves up a little bit to seem more important and as a result, they seem a little bit inauthentic. 01:14: And authenticity is such an attractive quality it’s one of the things that makes a performer compelling, their honesty. So good performance is not about fake behavior, good performance is authentic behavior in a manufactured environment. I’ll say that again because I have a feeling you’re gonna rewind that to listen again. It’s very important, and good performance is not fake behavior, good performance is authentic behavior in a manufactured environment. In order to be authentic, one needs to be comfortable in their own skin and comfortable with the discomfort that comes along with taking risks. 02:02: Now, we need to balance our desire to be true to self with what’s appropriate for any given situation. And remember, the different situations we find our selves in are manufactured. A job interview’s manufactured, a speech is manufactured, a sales meeting is manufactured, a team meeting that you’re leading is manufactured, these are all manufactured environments. And there are parts of your story that are relevant to the people in the room and helpful, and then there are parts of your story that might not be. There are some of your beliefs, some of your views on the world, are relevant to the people in that room and some of them are not. And in each of these situations, you have an agenda. That’s perfectly fine. Most of us have an agenda in the different situations that we find ourselves in. 02:58: So if you’re going into a sales meeting, your agenda is to move that sale forward. If you’re leading a team around a project, well your agenda is to have them get that project done on time, under budget. If you’re going in for a job interview, well you want the job. Me doing this podcast, I’m doing this podcast because I want you to say, “Oh this is valuable stuff, I’m gonna go buy a copy of ‘Steal the Show’.” that’s my agenda. We all have an agenda and I don’t think there’s anything wrong with it. And I think if you’re very upfront about your agenda, then people are often more willing to accept you and your agenda. But if you hide your agenda, and try to manufacture that result by manipulating people into that result, well then you seem inauthentic. 03:52: So what we do is, we get clear on our objective, that’s what the performer does, and then we decide the strategies or the tactics that we’re gonna use to achieve that objective. And then we ask ourselves, “Well, how can I be honest, real, authentic”, there’s that word again, “and true to myself in that particular situation?” And being true to ourselves is very important, the first chapter of Steal the Show is about finding your voice, but your voice does not need to be shared everywhere at all times. It doesn’t need to be shout… You know, you don’t need to shout from the rooftops all the time. So in some situations, some of your beliefs may not be helpful, in that they don’t get you closer to your goal more quickly. 04:47: So, for example, an easy example would be a project meeting with two different firms, with a number of people that you’ve met professionally a few times and now you’re working with. Well, you don’t need to share your political beliefs in that room. If you have a need to share them, then you need to ask yourself, “Why do I have this need to share them? Why do I have this need to share them right now? Because they could potentially cause conflict.” So if you are so true to self that you cannot change your style of behaviour so that it fits your particular agenda, but still stays true to your values, well then you may have trouble progressing forward. 05:31: And this is what’s so interesting, this is the… The ability to hold two different, opposing, thoughts or concepts in your head at the same time and still function. Fitzgerald gave us a great concept of the challenge of being a sophisticated thinker, is that, you often have ideas that conflict with each other, and this is one of those, this idea that you can be authentic but still adjust your style. You can be authentic while putting some parts of your either personality or your beliefs to the side in order to pursuit your agenda as you amplify other parts of your personality or style. 06:15: Additionally you don’t need to be all things to all people, you don’t have to have all the answers. There are questions about public speaking or performance that I might have to think about, I might know the answer right off the bat. The answer might be a difficult one, or maybe there isn’t an answer and if I try to make up an answer, even though there isn’t an answer, then I seem fake or phony or inauthentic because I’m trying to come up with some sort of truth where there isn’t one. 06:45: So, in closing I’ll say this: Be yourself, but understand that there’re certain parts of yourself that are not necessary to share, to involve, to promote in every situation. If you’re clear on your objective think about how you gonna get to your objective in a way that still honors your values and your beliefs and allows you to be comfortable in your own skin. And as a result people will be attracted to you, because you’ll fit into that environment quite nicely, you’ll be comfortable in that environment and you’ll be able to achieve your objective. And if you’ll be listening to other podcasts that I’ve done you know that we focused on results rather than approval. We focused on results rather than approval, that is our way. 07:43: So, if you liked what I have to say go ahead and subscribe, rate and review, so that other people see that there’s value here and that they can too steal the show, just like you. 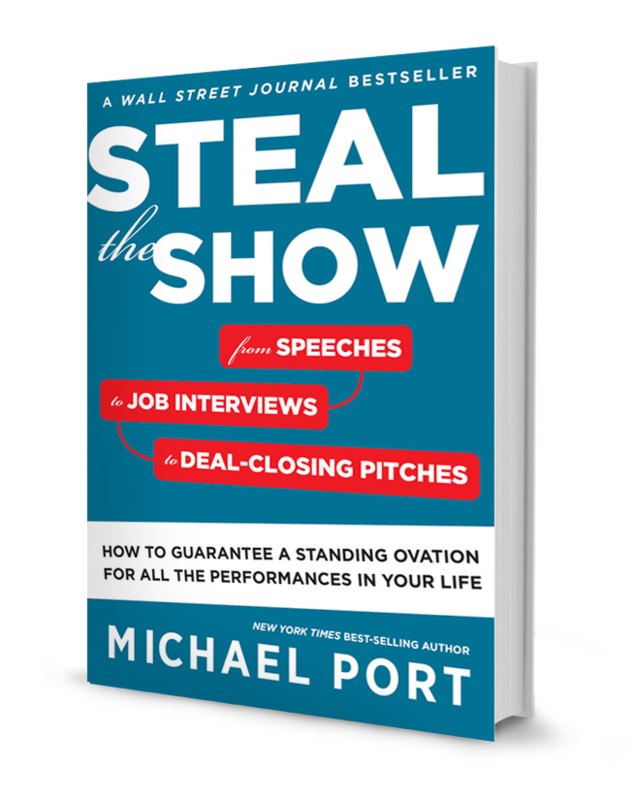 And if you haven’t read the book yet, go ahead pick it up on Amazon and go over to stealtheshow.com, there’s a lot of bonuses that I offer. And listen, just keep thinking big about who you are and about what you offer the world, keep thinking big about who you are and about what you offer the world. And I love you, not in a weird way. Well, maybe… No, not in a weird way but because you’re a big thinker, you’re somebody who is willing to raise the stakes, you’re someone who is willing to go out and create, you’re someone who is willing to do things that others might not be willing to, because they’re afraid of the criticism that may come along with the risks that they’re taking. But you’re willing to do it because you believe in the people that you serve, you believe in making a difference in this world. Thank you. Until next time, this is Michael Port. Bye for now.